Done right, email marketing is one of the best performing channels for the travel and tourism industry. So it’s time you start taking full advantage of it. The ticket to success lies in a email marketing strategy that will grow your big or small business. Your email marketing strategy will be like your roadmap to success. An effective travel email marketing strategy uses many types of email campaigns together. Allowing you to target customers in the best possible way. But how is this done? The secret weapon of the marketer should be the email platform: the best ESPs allow you to create and send emails with ease. They let you integrate and automate your email campaigns. In this guide, we will see how these two fit together. We will walk through some campaign examples that you should not miss in your travel and tourism email strategy. With each, we provide details on what features you need from your ESP to make them a success. 1. Which emails are effective in Travel Industry? 1. Which types of emails are effective in Travel Industry? Nowadays, travel and tourism companies are expected to offer a smooth customer experience. Which is why your best bet is to bring marketing, life-cycle and transactional emails to work together. Ideally, you need an email solution that allows you to create and send all of them. Marketing emails are mass messages sent out to all or targeted segments of your subscribers. Lifecycle emails are series of automated emails predefined according to where your subscriber is. Transactional emails are triggered by an action taken by a specific user to guide their process. Transactional and Marketing working together in your email strategy. 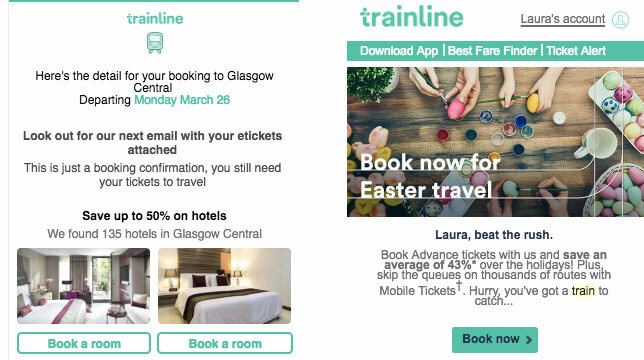 See these Trainline examples for instance, although easily recognisable as transactional (left) and marketing (right) they have matching styles. This is the first step. By making sure your marketing and transactional emails have the same branding, your customers will trust they are communicating with one company. A company that has a clear and distinguishable brand identity. Transactional and many lifecycle emails are “event triggered” automations. The travel and tourism industry has a proven high engagement with these type of emails. Customers are eager to make sure their experience is as smooth (well organised) and enjoyable as possible, and are more likely to open emails related to their purchase. This typically leads to greater engagement with emails related to the product or service being offered. Customers expect (and read!) automated emails from airlines, hotels, booking sites and tour operators, because these provide information or ask them to complete their bookings, add profile details, or check-in. We will show you travel and tourism email campaign examples that you should include in your travel and tourism email strategy. With each, we highlight what you need from your ESP to make them a success. But first, what should you look for in an email marketing software for the travel industry? In evaluating your email marketing software, there is nothing as handy as a ”packing list” with features your email marketing software needs to offer. Remember, email marketing is a powerful channel. The main decision point will be to what degree an ESP allows you to build lasting relationships with your customers, drive conversions, and increase your ROI. Here is our “packing list” of top must-haves for an ESP in the travel industry. Email creation and design: a powerful drag-and-drop editor to create your emails easily in a few minutes, and a variety of customizable and fully responsive email templates. Email personalization, for creating content that’s specific to the individual. Email segmentation to target your contacts based on their travel preferences and profile. Responsive subscription widgets to build your contact list obtaining full consent. These tend to work best when included in pages that provide value and content to visitors, such as blog, landing pages or a resource page. Structured and clear contact administration that allows you to manage your subscriber lists easily. A/B testing – to split test and optimise your campaigns. Detailed statistics that allow you to analyze and improve the newsletters you sent out. Strong marketing automation tools, helping you to manage planned customer/subscriber journeys. Integrations with your other apps and systems. CRM integration, allowing data to be used as quickly as possible after purchase, and at points of key interactions (e.g. key flight information). Zapier, which can be used as a pipeline to a number of other useful integrations. GDPR compliant your ESP must be GDPR compliant and have other certifications. And first-class deliverability to ensure your emails reach the inbox. References and other clients in the travel industry. Industry knowledge and email marketing best practices in travel and hospitality to share. Customer support and account management at the level you require. Marketing emails are vital for the travel and tourism industry, as they can have a massive impact on the reader. The right marketing communication can convince a subscriber to book that holiday they’ve been dreaming of for a long time, or inspire that last-minute booking. 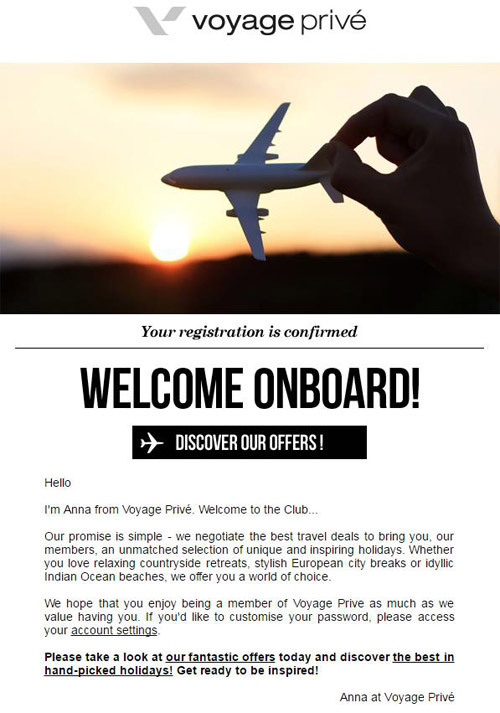 Newsletters are unmistakably core to any email marketing strategy, but especially in the travel industry. Fantasizing about city-breaks and beach vacations is something we’ve all done at some point. People may consider taking a vacation all year around, with peaks and dips, but we don’t know exactly when the decision will be made. That’s why, creating regular emails to keep in touch with them and promote your destinations will allow you to entice your contacts and be there when they need it. People won’t book a trip every time they get your newsletter. But by sending out content that adds value and that they enjoy reading, you will keep top-of-mind and they’ll probably think of your company once they’re ready to book their trip. Enticing and beautiful images of the holiday destinations. This can be cities, places or beautiful sceneries – either professional or user-generated. Text that invites subscribers to take action and research or book that destination. Special offers that call upon readers to take action. Inspirational content that targets a specific destination so that readers can find out more. Every ESPs will allow you to send newsletters, but there are specific features that you want it to have, so that you can make your newsletter campaigns that much better. For example the handling of images. It can’t be denied that visuals are vital for the travel and tourism industry. This is because they paint the picture of the destination. People in images can increase conversion, but it depend where they are. For Havana, pictures with people had twice the conversions. But, for images of nature — waterfalls, mountains, and beaches — photos with people actually performed flat or worse. Nature landscapes without (young) people are 22% more engaging for viewers 35 years or older. With high-quality photos, the conversion rates of other destinations like Austria and Slovenia got close to top destinations. Research from Tripadvisor, says that photos have the greatest impact driving engagement from travelers researching on hotel and B&B pages on their site even more than reviews. (While reviews are obviously still as important). With imagery being so important, you will want your ESP to allow you to include dynamic content and edit those images easily, but also easily include GIFs, videos, etc. Or to be able to insert the images dynamically from your site. As newsletters are sent out often, you want to save time creating the emails. An ESP that a offers reusable email templates and even creating and saving content blocks will make your life much easier. Collaborating on a single email is based on the email production workflow. Different teams and departments will have to work together for the email to fully resonate with your brand. First of all goals need to be brainstormed and set, then content has to be created and the email has to be designed. Before being sent, the email will have to be approved. If there is a a lot of back and forth in the creation of your email campaigns, you will want your ESP to offer changes approval, even dynamic features such as live collaboration within their email builder. Remember that personalization can have a big impact on the attention subscribers pay to your message. For example, you can include the customer’s name in a creative way in your images. It is a great way of making your customer feel valued, and giving the impression that content is specifically created and tailored for them. Limited offers are extremely popular in the tourism industry. Brands like Secret Escapes, Voyage Privé and Groupon, have turned the flash sales model into the core of their business. Although travelers are getting savvier and exploring multiple possibilities before booking their trips, many decisions are still made based on price, deals and discounts. Everybody loves a good deal, but continuous offers might not be the right approach for every hospitality offering. A hotel that only ever communicates to their guest list that they have a “great deal” for them, starts to look like a hotel that is on a fire sale all year round. How will a full-rate customer that stayed at their property feel if they get emailed each month with 15 to 50% discounts? “Discounts and Specials” can’t be the only reason you send an email to your hotel database, it has to fit with your branding. But even if you are not planning to do flash sales on a regular basis, offering tickets or upgrades at discounted rates can help boost sales during quieter periods. In order to send this type of offer emails, you want your ESP to do advanced segmentation and automated A/B testing deployment. * Segmenting a contact list allows you to pick the right groups to include in your specific flash sales and travel offers. Think about the customer profile. What are their preferred destinations and typical travel time of year? As well as considering purchasing behavior, you want to exclude people who already booked. * With A/B testing you can try different versions of your email to see what works best. For instance, the subject line and copy that will inspire the most engagement. For 100% conversion driven mail like this, you want to optimise and grab each conversion. A flash sale is over… in a flash, so there is not a lot of time for split testing. It is great if your test winner, can be automatically sent to the rest of your email list. 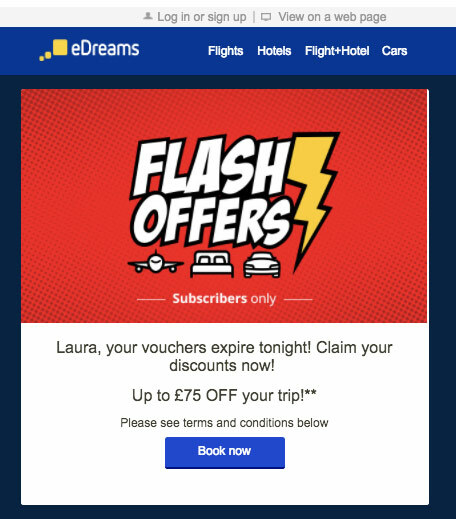 Displaying an animated countdown in flash sale emails can work to increase urgency in the reader. Seasonal events such as public holidays and vacation periods, can be your peak booking periods, but they are also a great excuse to promote some of your exclusive deals. Think about it… By communicating with the proper timing you can influence your subscribers and give them a little nudge into going on a trip during the Easter break or a Bank Holiday weekend. Never underestimate how valuable seasonal promotions are for the travel industry. We can take it a step further and go into specific events that take place during the year, making destinations even more attractive. Special interest events, such as Fashion week. Informing about special events may convince people to finally go for that trip they’ve been thinking about for a while. Designing creative campaigns around certain marketing moments provides variation and can have positive impact on your conversion. For seasonal emails, you want your email software to be able to target subscribers who looked for specific event travel topics on your website. This way, you can target people who have already shown an interest, to convince them to finalize their booking. 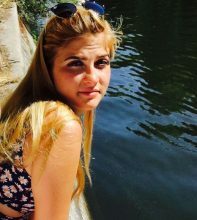 You may also want to target people who have previously booked a specific seasonal trip, as they may want to repeat the experience. For all this, advanced email segmentation based on behavior and purchases is the feature you are looking for. Email marketing for travel companies is certainly not only about mass emails. If email blasts are the only way you are currently excite your prospective travellers, you are missing out on the power of email automation. Travel is extremely personal, and so is the way people organize and time their vacations. Email automation allows you to customise your emails to be both personal and timely. Here are some key scenarios companies in the travel and tourism industry should consider when planning their email marketing strategy and choosing their ESP. Welcome series give you the opportunity to greet your customers when they join your community and to offer them valuable information to make the most of your services. Let them know what type of communication they can expect from you allow them to pick their preferences and enrich their profile. This will allow you to send more targeted emails later on that are more likely to interest them. If they subscribed during a purchase, a welcome series can contain useful information for their upcoming trip,like a tutorial to make the most of your service or platform. You can also consider promoting referral codes and discounts to share with their friends and family. Welcome emails can also be a great way to give new customers a brief introduction to your brand, and to present yourself. Voyage prive does this very well, by making all customers feel welcomed and valued regardless of their holiday preferences. The brand also uses the opportunity to highlight a “discovery” of the offers that are on at the moment. The Call to Action is repeated at the bottom of the campaign, almost like a PS, that stand out thanks to the use of bold font. To keep track of the success of the email campaigns you send out make sure your ESP provides detailed statistics and reports of how your automated emails are performing in different scenarios. Understandable stats for automated emails is not as standard as you might expect. The statistics for these valuable emails help you understand where and how you should improve your emails. Businesses in the travel and tourism industry rely heavily on users’ reviews and ratings of their offers. This is never ending, as more recent and “fresh” reviews are trusted most. However, people won’t remember to go back and share their feedback or leave a review by themselves (unless they’ve had a terrible experience). So, it is your role to remind them to do so. Consider combining a Thank You email with a CTA that drives users to a review site. If you want to make sure they don’t miss your feedback request, send them a dedicated email with a quick survey, so that they can rate their experience in just a few clicks. Always make sure that you let customers know how valuable their feedback is to you, as there is always room for improvement and you want to know how to provide the best user experience. 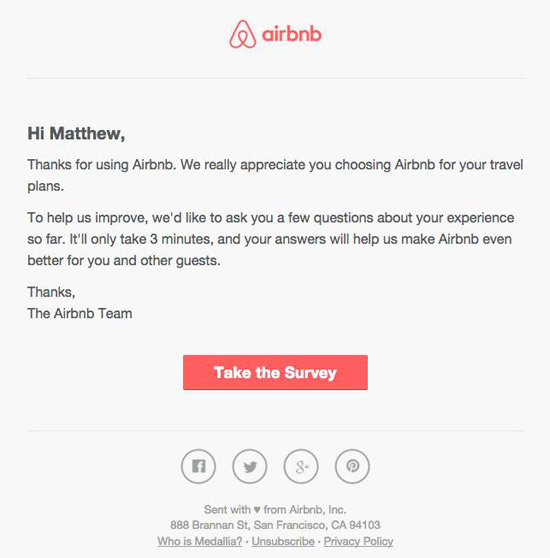 Airbnb’s feedback email is a good example. They explain that getting customers’ feedback will help them provide a better service, but they also they let the reader know that they value their time, so the survey will only take a few minutes. People tend to be put off by a long series of questions (who has the time for that?!) so letting them know that it will only be quick will increase chances of actually getting feedback from them. For feedback emails you will want your ESP to offer a platform that allows you to build responsive emails. This way, customers will be able to display your emails on their phones easily, and to take the survey on the go as they receive it on their phone. A survey builder could be another feature, depending on where you are planning to host and store these. It is not uncommon in the travel and tourism industry for businesses to have loyalty or frequent flyer programs to engage customers to return to them. Emailing members to let them know about their points, offering them promotions to increase their balance, or rewarding them for reaching a certain milestone is a way to keep them engaged and ensure they remember your brand. Alternatively, you can have different tiers for returning customers that always book their holidays through you, providing them with special discounts as they reach their fifth, tenth, fifteenth booking. Examples of loyalty programs that tend to be successful are exclusive rewards and loyalty clubs, frequent flyer programs, etc. Reward programs are a means to engage customers with your brand and reward their loyalty. 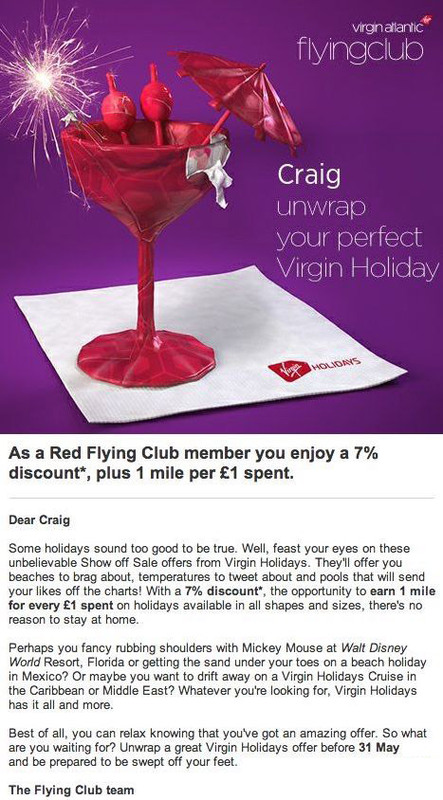 Like Virgin Atlantic, send out to your customers emails with special offers tailored to their tastes, or you can also, conversely, offer them something they may have not thought about. In its email, Virgin Atlantic offers customers an overview on a wide range of holidays they offer to stimulate their urgency to book something and have something to look forward to. Offering your customers a personalized experience will strengthen the relationship and build brand loyalty. One of the features that you definitely want your ESP to have, to ensure that loyal customers don’t miss out on these emails is a dedicated deliverability team. You want your ESP not only to take email deliverability very seriously, but also to offer you expert assistance so that, even when things go wrong, they can help you getting on the right track. While competition in the travel and hospitality industry is fierce, email marketing is one of those rare channels that can help you nail it and both attract and retain customers. 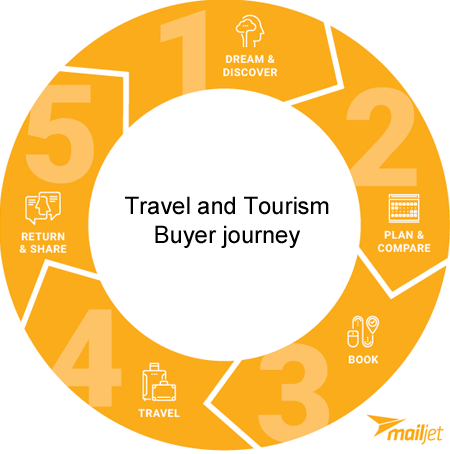 Newsletters, deals and inspirational emails, loyalty and all type of life-cycle automation can give you a competitive edge to keep travelers coming back for more. Finding the right email marketing strategy and the right email software partner for your company will take time, but a thorough job will be rewarded. Marketing Assistant at Mailjet in the UK. Italian born, I have Brazilian and English blood flowing through my veins. I have earned the nickname of Cactus because I can be prickly at times. Now, the Saguaro has become my spirit, ahem, plant. ?